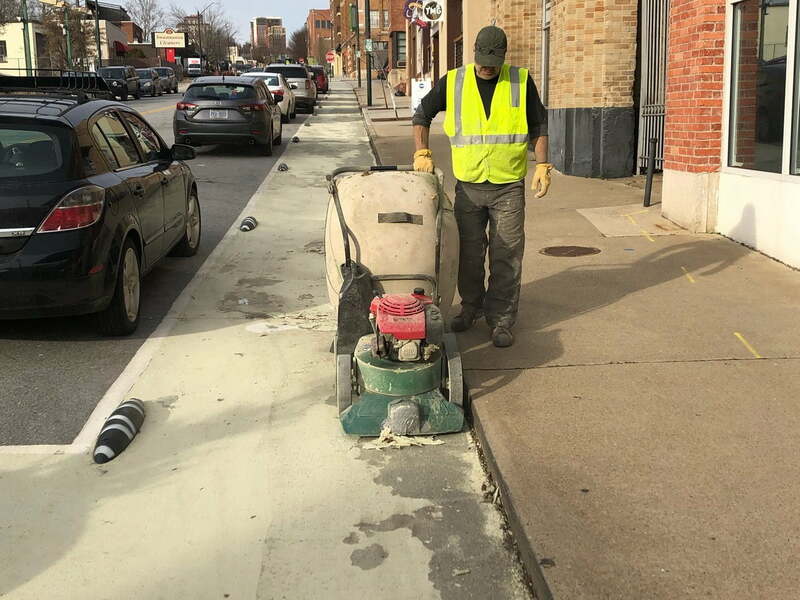 We’re writing to update you about a problem that has made the news this week: the paint is failing on the multi-use path portion of the Coxe Avenue tactical urbanism project. We apologize without reservation for the failing paint on the multi-use path. Asheville on Bikes, AARP, Blue Ridge Bicycle Club, and Street Plans stand behind this work. And that is the first thing to know: This project is fully supported. The Street Tweaks team and our volunteers began cleaning the corridor within 24 hours of learning the extent of the problem, and we will continue supporting the project as needed, including clean up and removal of additional failing paint in the multi-use path. Our multi-use path paint was provided by U.S. Specialty Coatings, along with paint consulting advice, as part of the design phase of our project. We followed their recommendations for our install process, but we ultimately found that advice to be flawed and the products they provided failed in our application. If you are a paint nerd, as we are now, feel free to hit us up and we’ll share the spec sheet details, along with more of our frustrations with this vendor. The tan paint has begun flaking and separating from the roadway, after going through multiple freeze/thaw cycles following our recent snow. Some of those flakes moved to the sidewalk and adjacent parking areas. 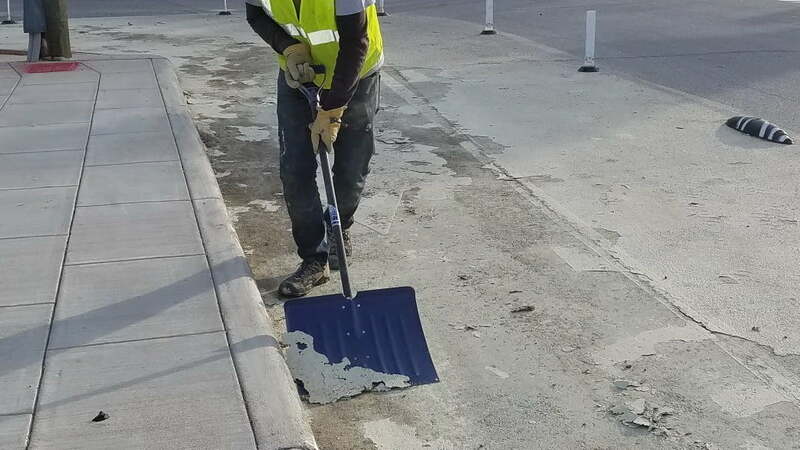 The Street Tweaks team removed all loose paint in the roadway during work on Dec 18th and 19th, including some of the loose paint that flaked onto surrounding properties. This paint removal work intercepted the bulk of the loose flakes trapped along the curb before they could spread further, but there is further work to do to clean up paint flakes on the corridor. The Street Tweaks team has assembled a rapid response team who are capable of further clean up work as the remaining paint continues to flake off. 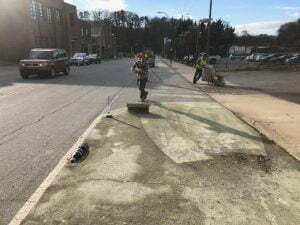 We will have one or more further workdays until we reach a point where we have removed nearly all of the tan paint from the multi-use path, the roadway, the sidewalk, and parking areas of any adjacent businesses. With the paint removed, we will wait for warm Spring weather before cleaning and repainting the multi-use path, using paint and consulting advice from a new vendor. Is this an environmental problem? The paint that is flaking is dried latex paint. Though the flakes of paint look bad, they are less harmful than other materials that already enter our storm sewers this time of year, like the salt used on our roads after each snow. 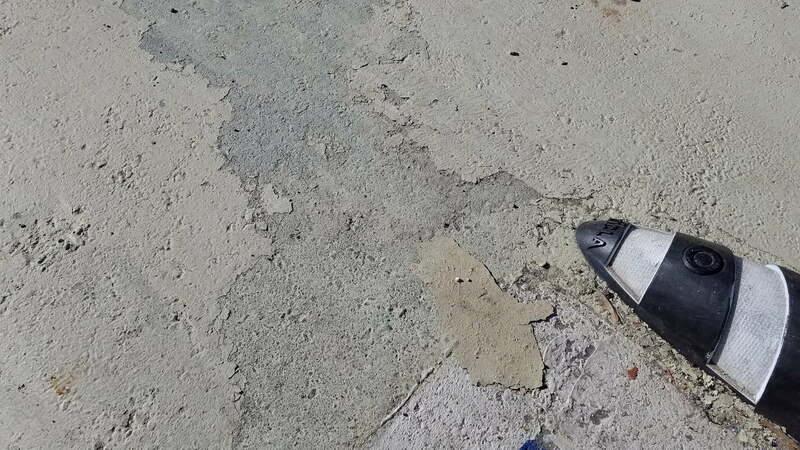 Further, most of the flaking paint was intercepted and removed using a street vacuum before it had a chance to spread from the immediate area. Even though the flakes are unlikely to cause environmental harm, we are committed to removing them, before they can enter the storm drains on the corridor in any significant amount. Is the street going to be closed for any of this work? At this time, we do not anticipate any street or parking closures as we execute our paint removal work. The loose paint removal work on the corridor on 12/18 and 12/19 went smoothly with no street or parking closures. What should you do if your business is affected by flaking paint? Contact our team by using this email address, mitigation-plan@ashevilleonbikes.com. We will respond via email and send someone to your business to assess the problems, plan work, and remove flaking paint. Depending on the extent of the problem, those three steps may all happen during one visit. 11/6/2018 Initial partial failure of paint in multi-use path. New paint provided by manufacturer. 11/10/2018 Repaint of multi-use path with new recommended paint. 12/9/2018 First major snowfall in Asheville, followed by freeze/thaw cycles for the next week. 12/17/2018 We were notified about chipping paint on the Coxe Ave project. 12/17/2018 Initial assessment reveals extent of the problem; all multi-use path paint is failing, in the form of flakes lifting off road surface. 12/18/2018 Removal of failed and loose paint on corridor. 12/19/2018 Removal of failed and loose paint on corridor. 12/22/2018 Removal of failed and loose paint on corridor. 12/24/2018 Removal of failed and loose paint on corridor. Thank you for your patience as we clean up the paint flakes. 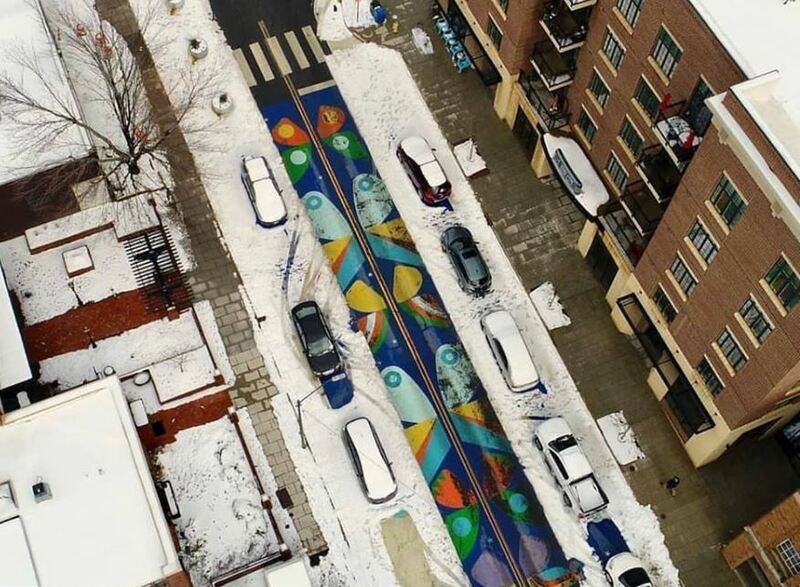 Curious why Street Plans doesn’t know about paint and freezing, snow, etc when they have worked on projects in Minnesota, New Jersey, Vermont, Ontario, Massachusetts, New York, New Hampshire. Did a paint vendor just get selected based on their claimed expertise, or did anyone have actual successful experience with the selected paint vendor? The paint vendor has supplied paint for other projects that Street Plans worked on, enough that we considered the paint company a proven choice. The vendor gave our project specific advice about paint and temperature (that it was, for example, safe to apply in temps as low as 40 degrees) which we relied on to put down the tan multi-use path paint. We now know that we have received either bad paint, or bad guidance, or some combination of both. We have spoken directly with the paint vendor and Street Plans about this problem. Without going into too much detail, Street Plans is standing behind the project and has provided a refund for the full cost of the paint order as well as other offers of help. The paint vendor, however, is not similarly acknowledging their responsibility. We must note that though the paint company has waffled, they did offer discounts on future paint orders. Given the amount of work that flows from their prior bad advice, that offer should have gone much farther. We are also told that Street Plans has stopped working with the paint company on all projects as a result of the that company’s decision to not fully stand behind the product and the installation guidance they provided. What a stupid mess. Bags of paint chips are left on the sidewalks. Paint chips are still on the parking lots of 180 and 167. Bushels of chips are stuck in the grass at 167 and down from there. People are still parking in front of the garage door at 180A. The drainage from the “planters” has stained what is left of the paint. Coxe already had nice wide sidewalks and bike paths, now the bike path has dog walkers and little girls carrying balloons in it. Considering the environmental impact of the paint chunks, how about I scrape up a bowl full, pour on some milk and invite you to eat up? One of the excuses for this fiasco was bicycle safety, dare tell me how many not bicyclist causef injuries have EVER been reported on this part of Coxe?? How many parking places were lost?? The only good thing that happened was the stop sign and crosswalk at Buxton. REMOVE THE REST OF THIS MESS! We recently were told at a South Slope meeting that proper paint would have cost 5 times as much as the paint used. Classic case of you get what you pay for it. You should publish the name of the paint company used. They deserve some social media trolling from residents. Many other design issues were discussed at that meeting. I am a fan and advocate of public art. The poor planning and execution of this project could hurt future projects. Thank you Linda. The paint company that provided the failing paint is U.S. Specialty Coatings, http://www.usspecialtycoatings.com/Home.aspx. Though it is true that different grades of paint have different costs, the paint that was applied to the multi-use path was traffic grade paint rated for use on asphalt; it was not chosen based on low cost. In all parts of the project the price of the materials used, though considered, was not a primary factor in the materials that were selected. We wanted the right materials for the job and we are not satisfied with the advice or durability of the products that U.S. Specialty coatings provided. We don’t think that they deserve to be trolled, though we have also chosen to part ways and seek a new vendor for the repaint of the multi-use path that is likely to occur in the Spring. All of the feedback is well received and this test will evolve based on what is learned from the designs. 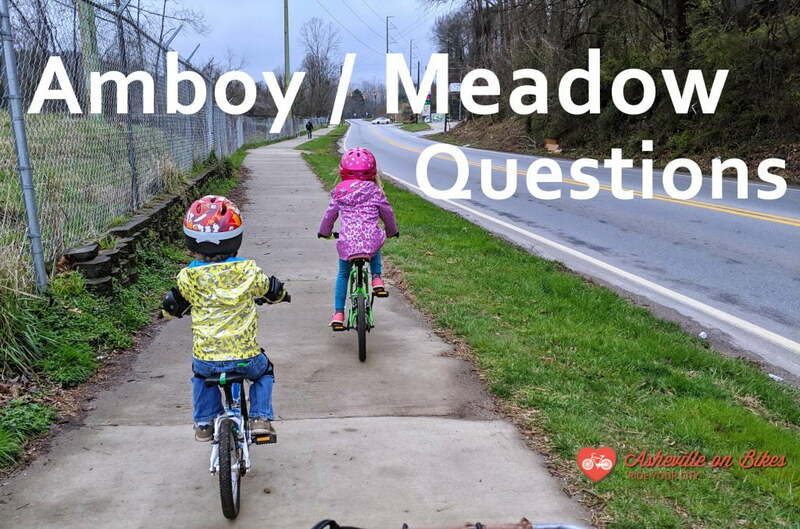 If a resident has a specific request about paint or some part of the design that needs immediate attention, they can email mitigation-plan@ashevilleobikes.com and receive a prompt direct response about any issue with this project on the corridor. Thank you Fred. We appreciate your feedback and understand your frustrations, particularly with the complications of the failing paint. We apologize without reservation for the multi-use path paint and are actively working to fix the problem. (1) Those bags were produced by our cleaning trips up and down the corridor and are being removed at the end of each work session on the corridor. (2) The additional multi-use path is intended to function as a sidewalk extension, and it was painted with stencils to show the different types of activities that might go on using such a wide sidewalk-like path. Bicycling is allowed in the multi-use path but that path is not designed or described as primarily a bike path. (3) That multi-use area came about through the public process during the summer of 2018, where strong feedback was provided that favored adding pedestrian features to the corridor. This project was not created because of cycling injuries on the current corridor – it was created as a test to find a better street design that balances the features on the street with the needs of all users. If you have not read our other materials about this test, they can be accessed here. (4) The initial installation removed 2 on street spaces; design tweaks since the install have resulted in the removal of two additional spaces, one of which you requested removal of, in order to access the garage door at 180A. The remaining on street parking is in a different configuration the parking on the prior street in order to make room for the other features of the project. (5) We’re glad you like the stop signs and crosswalks. We like them too. We have created an additional route for getting personal attention and dealing with problems on the corridor, like paint chips migrating onto private property. You can request paint cleanup or report a specific concern about something on the corridor at this email address: mitigation-plan@ashevilleonbikes.com. Any emails will receive a prompt and direct response from the team. We welcome all feedback and actively support this test project, as one of the groups in the Street Tweaks team. I helped put this paint down. It was a high-quality asphalt paint. It’s a shame it’s peeling but these things happen. The purpose of the project is to learn what works and what doesn’t and to save us all millions on a large government project gone wrong. I’ve painted a few yachts and sometimes the paint just fails. The manufacturer always blames the application rather than admit fault. Why paint it? What about an outline applied with what DOT uses on roads to line then. This stuff stands up to everything, even snow plows and your poor freeze thaw cycle excuse. A tan painted path looks tacky and becomes a slip hazard. We agree. Your observation is spot on regarding time of year. Paint failure aside, the negative impact the project was immediate. The street congestion (real or perceived) is disturbing. Now, you can’t open the door to your car without being in danger of a passing car taking it off. While their intentions were good, I believe Street Tweaks could have accomplished their goals by simply putting up the stop signs and repainting the crosswalks. The project has turned into a disappointment and an eyesore. There no paint made that will hold up to daily traffic running across it. It seems like a waste of money to me. They have taken away street parking spots and deliberately closed off one entrance to the parking lot for my building. The planters have been backed into by cars and moved from their original spots. This will be a continuing problem. Asheville on Bikes has taken ownership. I commend you on that and the clean up effort.